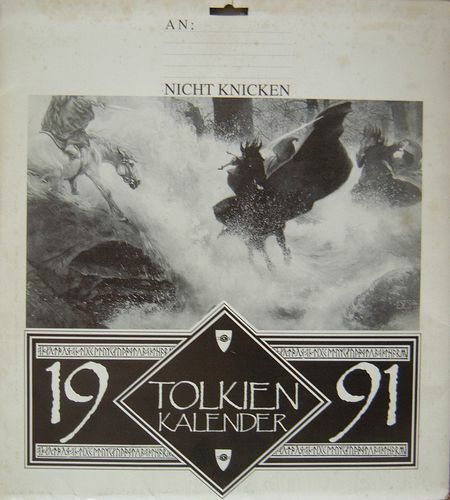 More of the hard-to-find Beyond Bree issues, the first of the equally difficult Polish Tolkien Society calendars, and the rare Mythopoeic Society The 1990 NOT Tolkien Calendar. 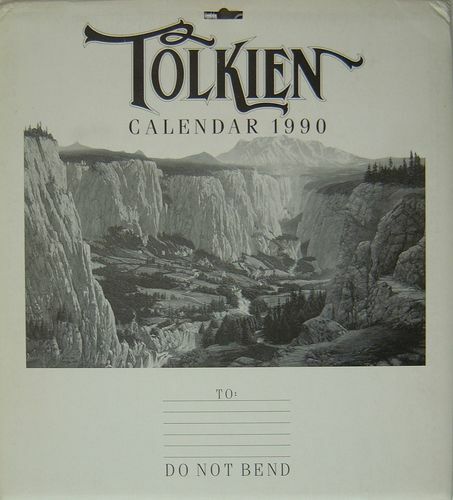 Also, the very popular 1992 calendars issued for the Tolkien Centennial. 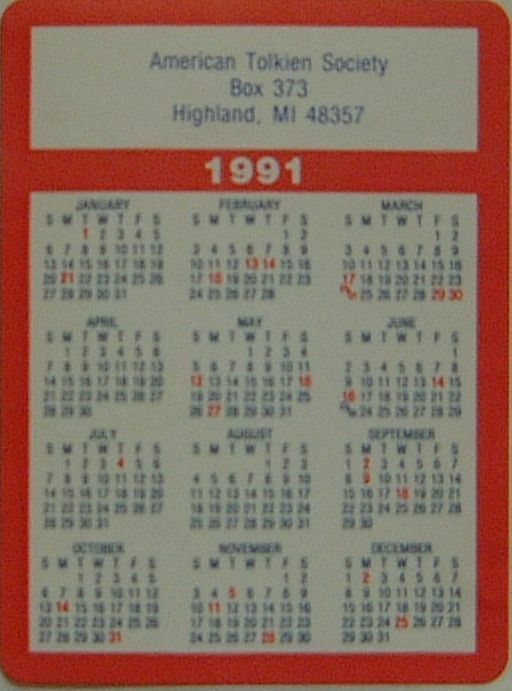 Only three calendars were issued in 1989, the fewest since the "lean years" of 1981 - 1984. 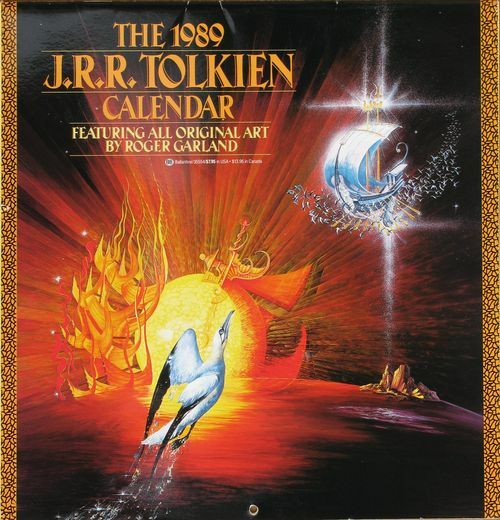 "The 1989 J.R.R. Tolkien Calendar" Illustrations by Roger Garland. Dimensions: 11.5 x 12 inches (w x h); stapled; punched hanging hole; shrinkwrapped. 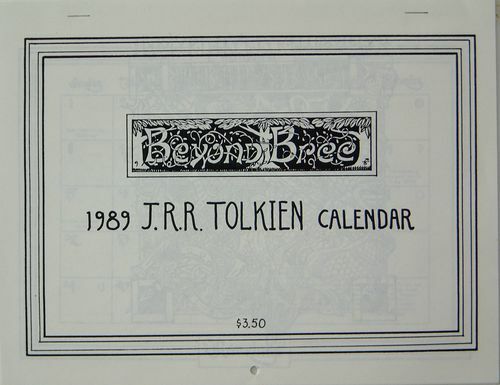 "Beyond Bree 1989 J.R.R. 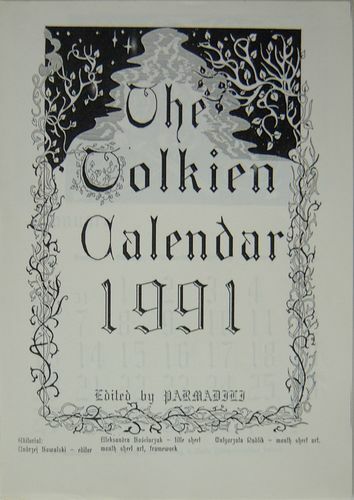 Tolkien Calendar" Published by the American Mensa Tolkien Special Interest Group; edited by Nancy Martsch. Pen and ink illustrations by eight artists. Dimensions: 11 x 8.5 inches (w x h); stapled to open out to 11 x 16 3/8 inches; manila envelope. 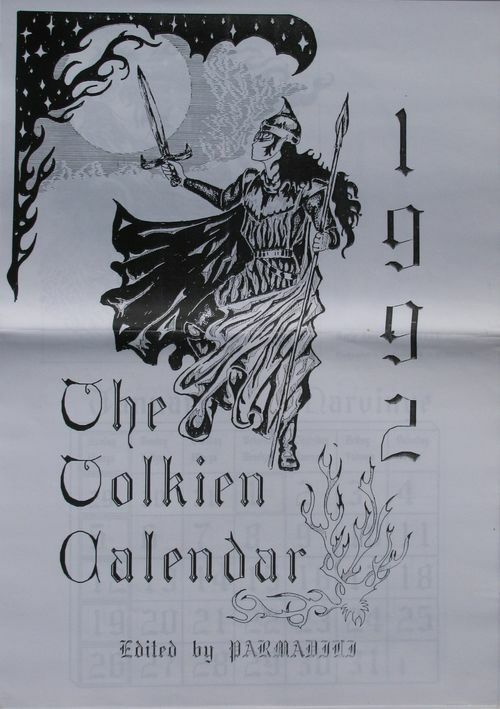 "The Tolkien Calendar 1989" Illustrations by Roger Garland. Cover: "The Haven of Morionde". Dimensions: 13 5/8 x 15 inches (w x h); wire bound; heavy wire hanging loop; medium-weight paperboard mailer/envelope printed with theme similar to cover. "The 1990 J.R.R. 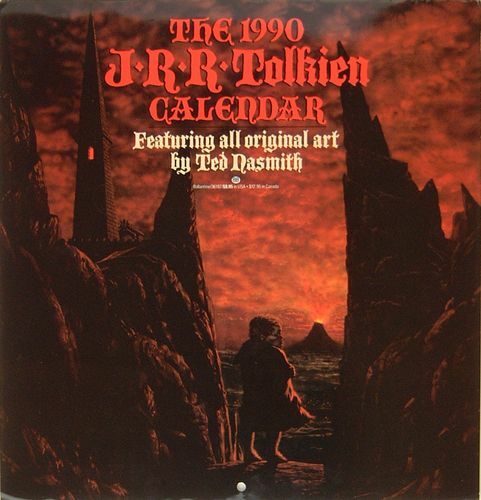 Tolkien Calendar" Illustrations by Ted Nasmith. Cover: "Sam Enters Mordor Alone". Dimensions: 11.5 x 12 inches (w x h); stapled; punched hanging hole; shrinkwrapped. “J.R.R. 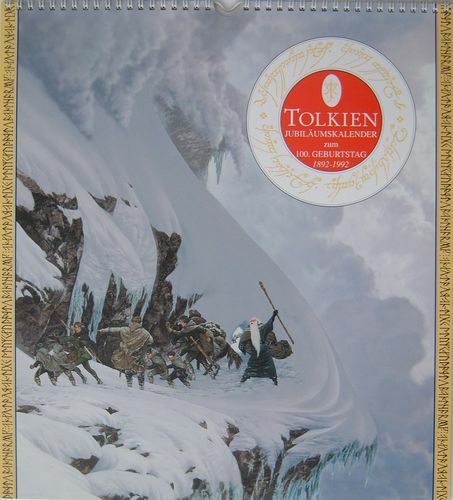 Tolkien – Master of Middle Earth” Published by Miles Kimball, Oshkosh, WI. 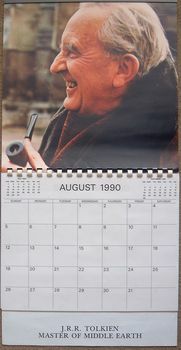 An oddity in that the calendar went from August 1990 to August 1991. Photo of JRRT on Kodak paper. Dimensions: 10 x 20 inches (opened for hanging); metal tab with punched hanging hole; white comb-bound (see photo). Rarity: 9 Unknown number created. I know of two copies. 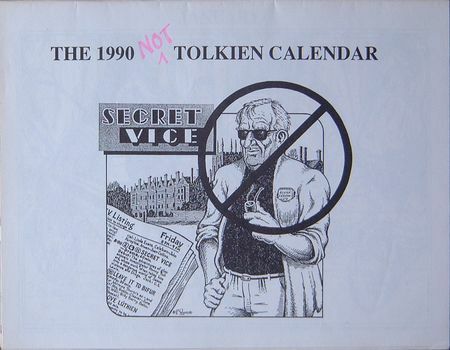 “The 1990 NOT Tolkien Calendar” Hysterical satire (picture Gandalf et al in thongs!) Black and white illustrations by Paula Di Sante, Christine Lowentrout, Sylvia Hunnewell, Sarah Beach, Tim Callahan, Pat Wynne, Lynn Maudlin, Bonnie Callahan, Nancy-Lou Patterson. Read Lynn Maudlin's letter about it. I was fortunate to get my copy signed by Lynn, Bonnie, Sarah, and Paula at MythCon 39. Dimensions: 11 x 8.5 inches (w x h); stapled on the fold. 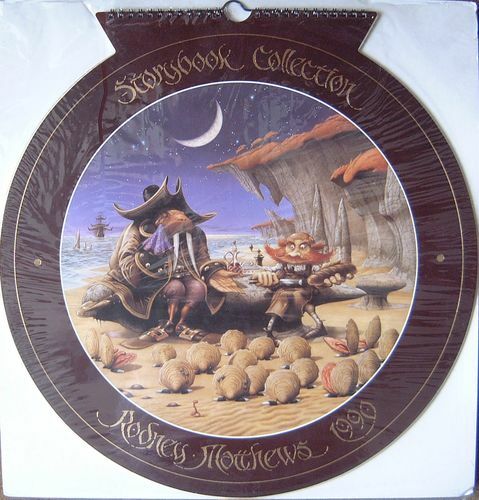 “Storybook Collection Rodney Matthews 1990” Illustrations by Rodney Matthews. 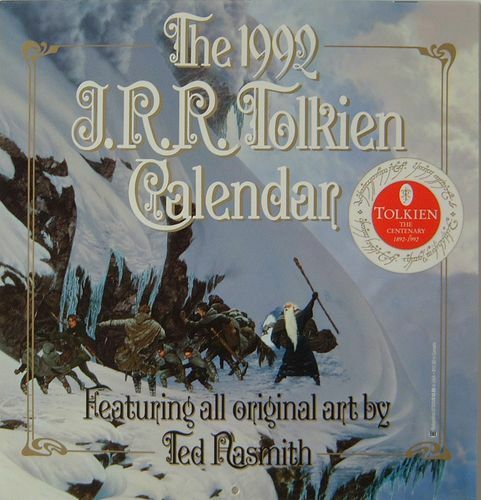 A fantasy art calendar with several illustrations related to Tolkien. Dimensions: 16.5 x 17 inches (w x h - approximately circular); wire-bound; heavy wire hanging loop; shrink-wrapped with white board backing. "Inklings Calendar 1990" Calligraphy by Joanne E. Klein; black and white, and reds, grays on off-white paper. Dimensions: 11 x 8.5 inches (w x h). Rarity: 9 These Inklings calendars appear infrequently on eBay. 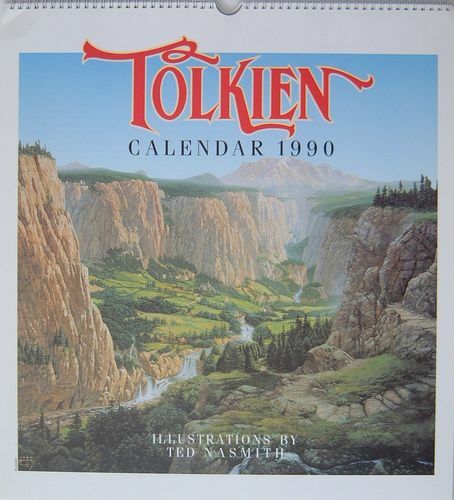 "The Tolkien Calendar 1990" Illustrations by Ted Nasmith. 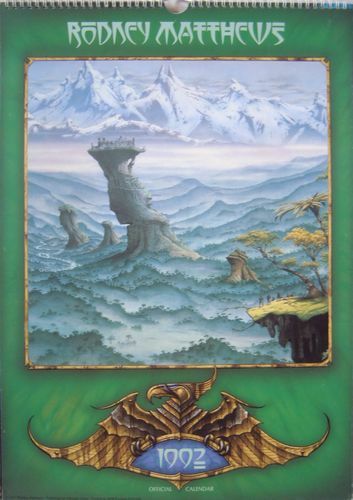 Cover: "Rivendell". Dimensions: 13 5/8 x 15 inches (w x h); wire bound; heavy wire hanging loop; medium-weight paperboard mailer/envelope printed with theme similar to cover. Small self-adhesive calendar. Dimensions: 3 x 4 inches (w x h). "The 1991 J.R.R. Tolkien Calendar" Illustrations by John Howe. Cover: "Old Man Willow". Dimensions: 11.5 x 12 inches (w x h); stapled; punched hanging hole; shrinkwrapped. 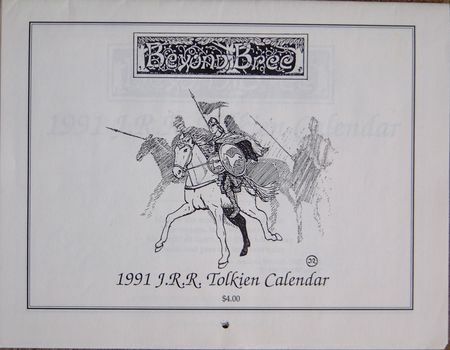 "Beyond Bree 1991 J.R.R. 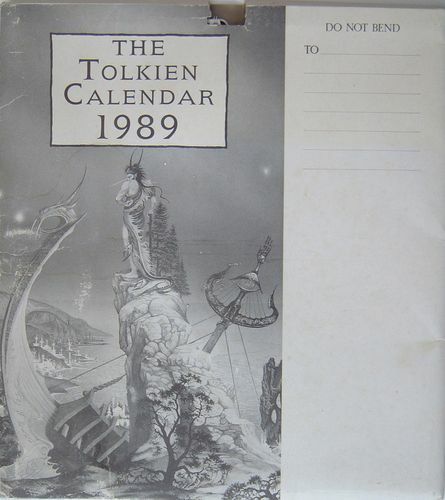 Tolkien Calendar" Published by the American Mensa Tolkien Special Interest Group; edited by Carl Hostetter. Black and white illustrations by international list of nine artists. Dimensions: 11 x 8.5 inches (w x h); stapled on the fold; punched hanging hole; envelope. 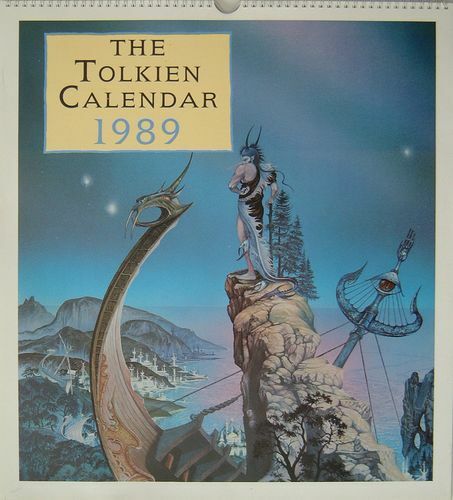 "The Tolkien Calendar 1991" Illustrations by John Howe. Curiously, the 10-digit ISBN is printed only above the barcode on the back of the mailer. On the back cover of the calendar itself, the barcode reports the 13-digit ISBN 9 780044 406778.Cover: "At the Ford". Dimensions: 13.5 x 15 inches (w x h); wire bound; heavy wire hanging loop; medium-weight paperboard mailer/envelope printed with theme similar to cover illustration. 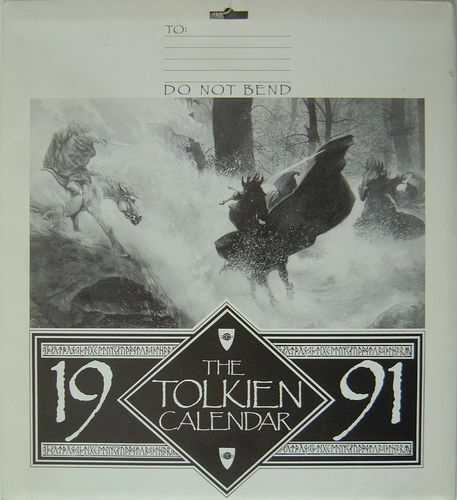 VARIANT: "The Tolkien Calendar 1991" Same as the 0-04-440677-0 issue, but shrinkwrapped. As it has no mailer/envelope and reports the same 13-digit ISBN as the UK issue, the only way to distinguish between the two is "$11.95" (the price) which is found just to the left of the barcode on the back cover of the calendar. Dimensions: 13.5 x 15 inches (w x h); wire bound; heavy wire hanging loop; shrinkwrapped. "The 1992 J.R.R. 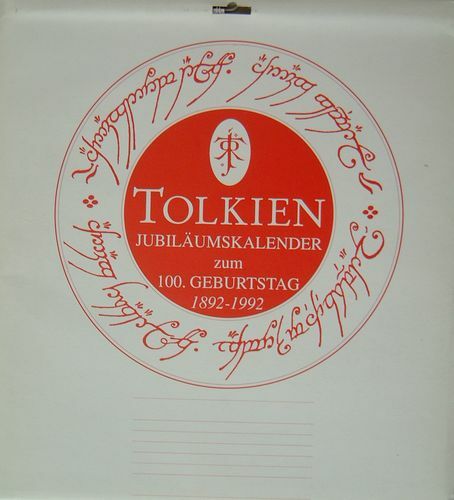 Tolkien Calendar" Centenary issue. Illustrations by Ted Nasmith. 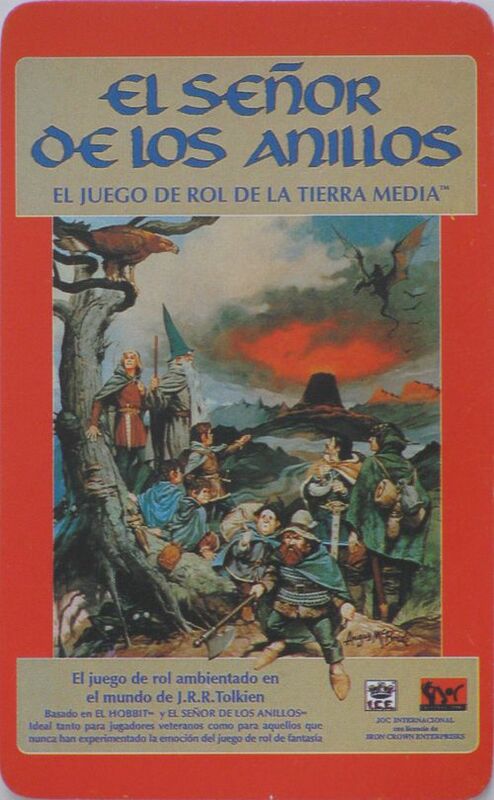 Cover: “The Anger of the Mountain”. Dimensions: 11.5 x 12 inches (w x h); stapled; punched hanging hole; shrinkwrapped. “Beyond Bree J.R.R. 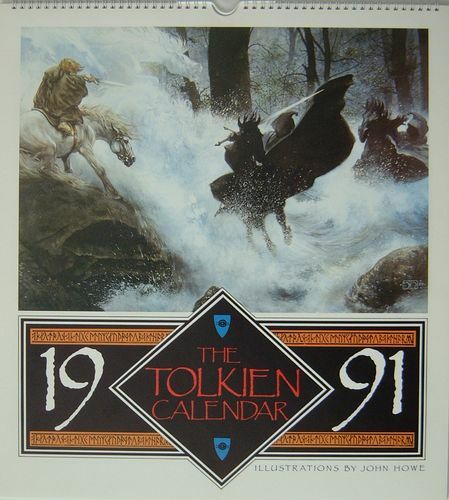 Tolkien Calendar 1992” Published by the American Mensa Tolkien Special Interest Group. Black and white illustrations by six artists inspired by "The Silmarillion"; edited by Nancy Martsch. Dimensions: 11 x 8.5 inches (w x h); stapled; envelope. 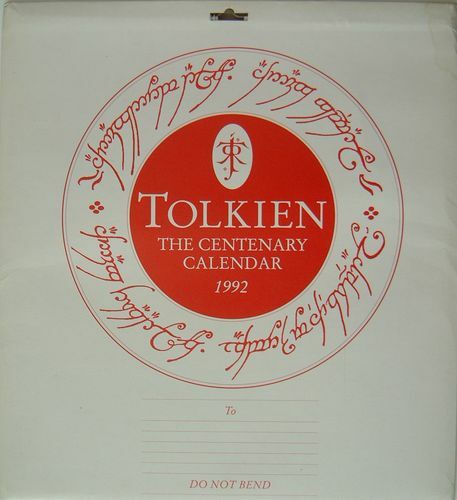 "Tolkien The Centenary Calendar 1992" Centenary issue. Cover: “The Anger of the Mountain". Illustrations by Ted Nasmith. 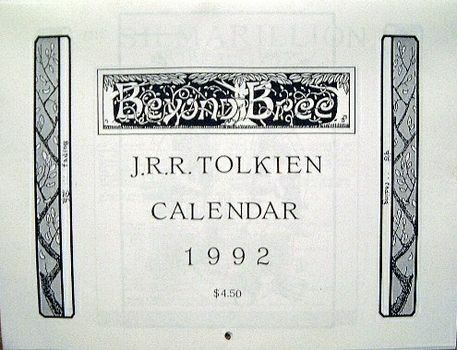 Dimensions: 13.5 x 15 inches (w x h); wire bound; heavy wire hanging loop; medium-weight paperboard mailer/envelope printed with “Tolkien The Centenary Calendar 1992”. The illustration of the mailer was printed in red ink. 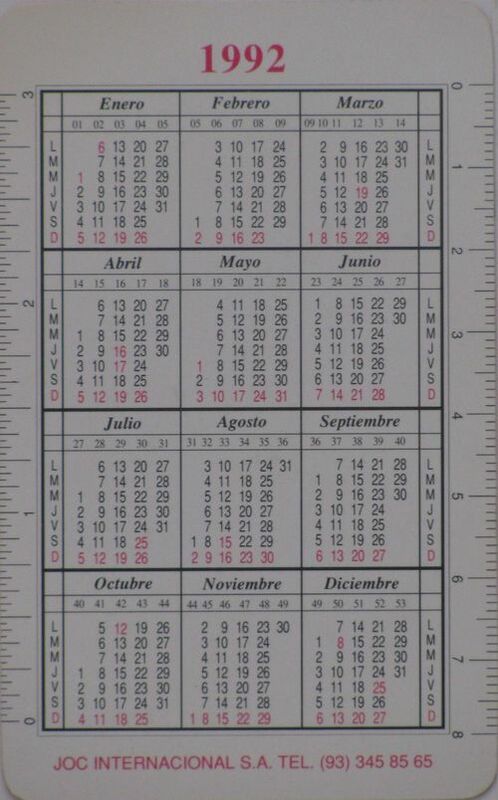 “el Señor de los Anillos" Credit card-sized calendar with 1992 calendar on back. Dimensions: 2 3/8 x 3 3/4 inches (w x h). “Rodney Matthews 1992 Official Calendar” Illustrations by Rodney Matthews. 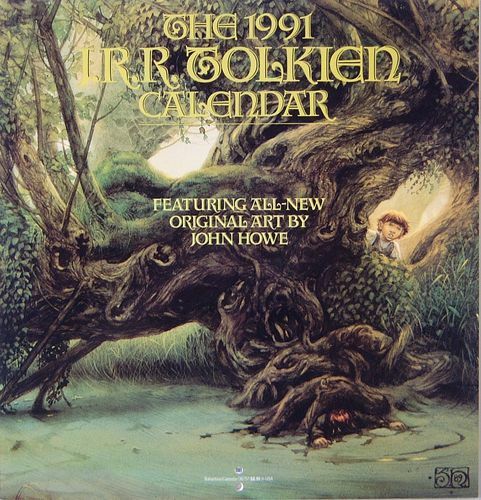 A fantasy art calendar with one illustration (April: "Treebeard") related to Tolkien. Dimensions: 11 5/8 x 16 5/8 inches (w x h); wire-bound; heavy wire hanging loop.